Healthy Sleep for New and Expecting Parents. It’s not breaking news to say that becoming a mom means lots of changes. Motherhood brings abundant joys, but sadly, better sleep is not one of them. There’s no shortage of jokes or anecdotes about pregnant mothers and parents of newborns being so sleep-deprived as to be virtually sleepwalking through each day. While we don’t want to go overboard with the cliches, this issue is one that is certainly on the minds of expecting moms and dads and new parents alike. Healthy Sleep for New and Expecting Parents. Beginning with pregnancy and into parenthood, there are numerous ways in which sleep can be disrupted. Changes to the quantity and quality of sleep are commonplace and can affect both moms and dads. While some parents may assume that consistent sleep deprivation is inevitable, there are in fact steps that you can take to improve routines and sleep hygiene. Understanding the ins and outs of sleep in pregnancy and parenthood can enable you to wake at least slightly more well-rested every day. This sleep guide for moms and dads starts with information for pregnant moms and then covers information for parents of newborns. We’ll also provide links to resources that can help you read more, connect with others, and find products that may contribute to your sleep. There are a number of ways in which pregnancy can affect sleep, but these effects are not the same throughout the entire time that you’re pregnant. Instead, the biological changes associated with each trimester influence the sleep that you might get as an expecting mom. The first trimester is made up of the first 12 weeks after conception. Very early in the first trimester, the fertilized egg becomes attached to the inner wall of the uterus, and your body starts to produce high levels of the hormone progesterone. After 3 weeks, you enter the embryonic stage in which the embryo begins to grow and its organs start to develop. After 8 weeks, the embryo has continued to grow and becomes a fetus. These changes can impact sleep in a few ways. First, increased progesterone can alter your sleep patterns. Progesterone is generally sleep-inducing, but at these elevated levels, it can disrupt a normal sleep cycle. It may make you fatigued during the day but prone to sleep disruptions at night. Second, both progesterone and the pressure on the bladder from the growing baby can increase how frequently you have to urinate. This can obviously make it harder to sleep through the night. Third, as the baby grows, swelling of the breasts, pelvic pain, and cramps can complicate efforts to settle in for a good night’s sleep. Exercise: it seems counter-intuitive, but exercise can combat fatigue and body aches. While you don’t want to over-exert yourself, regular exercise can contribute to your sleep hygiene. Take naps: short naps in the afternoon can help keep you rested and offset the fatiguing effects of progesterone. Watch what you drink: avoid caffeinated beverages that can make it harder to fall asleep. Drink more water during the day than at night in order to reduce the nighttime need to urinate. Avoid spicy foods: as delicious as that habañero salsa looks, it’s generally best to stay away from really spicy dishes, especially for dinner. Choose lighter foods before bed:eating a big or heavy meal soon before going to bed can exacerbate morning sickness, so try to opt for light snacks in the evening. Morning sickness is also an issue that often arises during the first trimester. These tips may help in countering it.. In the second trimester (weeks 13 through 27), motion sickness usually goes away, and your body has had more time to get used to hormonal changes. You may start to feel the baby moving, and cramps may occur more frequently, especially leg cramps at night. Other biological changes can include heartburn, particularly when you lie down, and vivid dreaming, which may start in the first trimester but often intensifies in the second. Cramping, heartburn, and intense dreaming can all disrupt sleep. Bodily discomfort or acid reflux may make it hard to fall asleep, and vivid dreaming may cause you to wake up more commonly in the night. Watch out for acidic, fried, or spicy foods: while you may no longer need to worry as much about morning sickness, it’s still important to choose foods wisely so as to reduce heartburn. All of these types of foods can make it worse, so try to avoid them, especially at night. Elevate your head at night: you can use pillows or an adjustable bed (if you have one) to help decrease acid reflux. Get relaxed: deep breathing and other relaxation techniques can reduce stress and create a sense of calm when you’re going to bed. They may also help you get back to bed when you wake up in the night. The third trimester starts on the 28th week of your pregnancy and brings about big changes for both you and your baby. The growth of the fetus can put a lot of strain on your lower back, and cramping from the second trimester often intensifies. Added pressure on the bladder makes trips to the bathroom to urinate more and more frequent. All of this can add up to significant discomfort that complicates both falling asleep and staying asleep. Stretch before bed: as part of your bedtime routine, build in light stretching or yoga. This can help with cramping and may also be a useful tool for relaxation. Use pillows strategically: careful pillow placement can get you positioned comfortably, and pregnancy pillows, which are specially designed to relieve pressure, are another option to consider. Try to follow a routine: despite all the potential for sleep disturbances, it’s still helpful to try to follow a consistent timeline for getting ready for bed, getting into bed, and waking up. Talk to your doctor: it’s OK to raise sleep concerns with your doctor. Definitely tell your doctor if you’re noticing an itchy feeling in your legs, which can be a sign of Restless Leg Syndrome, or a dramatic increase in snoring, which is a possible sign of obstructive sleep apnea. 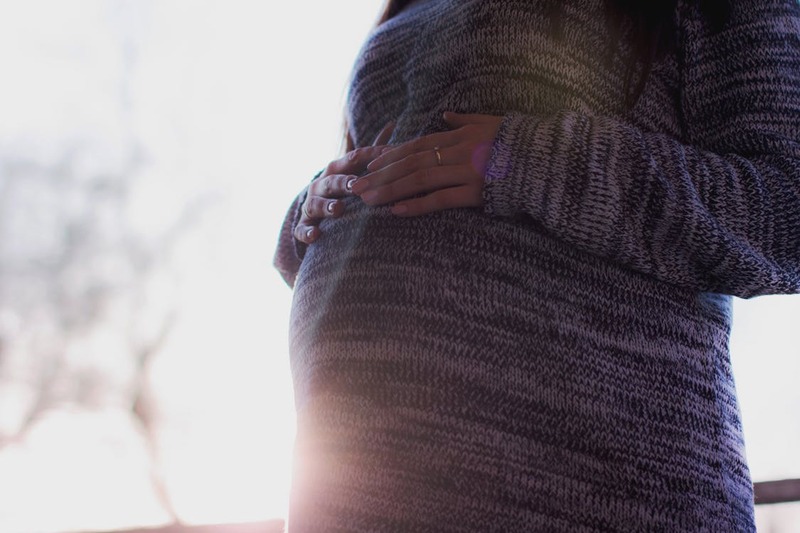 All of the physical changes that come about during pregnancy can be uncomfortable and can pose a serious challenge to making bedtime inviting and actually restful. An important consideration in dealing with this is sleeping position. Optimizing your sleeping position can improve your comfort, sleep quality, and even the health of your baby. Changes to body shape: changes to your body — namely the much larger size of your abdomen — can complicate your ability to lie down comfortably or to lie in certain positions. Lower back pain: the strain on the lower back can cause regular pain even when sitting or lying down to reduce the pressure on your back. Cramping: cramps in the pelvic area and in the legs can persist for months, causing pain and discomfort. Shortness of breath: an increase in hormones can cause uncomfortable shortness of breath. Pressure from the baby on your diaphragm can also cause this issue. Heartburn: because the digestive system slows down, there is a greater risk of heartburn, and this risk is heightened when lying down. It is generally accepted that the best position for sleep during pregnancy is on your side. This position is sometimes abbreviated as SOS (sleep on side). Some research suggests that the best version of SOS is being on your left side because it facilitates maximum blood and nutrient flow to the fetus. There’s no harm in spending some of the night on your right side, but in general, it’s considered optimal if you can spend most of the night on your left. In the SOS position, most experts recommend bending your knees to reduce pressure on the lower back. Putting a pillow between your knees and/or under your abdomen can further reduce pressure on the back and add comfort. Other modifications of the SOS position include putting an extra pillow under your head to decrease heartburn or behind you to keep you upright and reduce shortness of breath. If SOS isn’t your normal sleeping position, you can experiment with different pillow locations to help make this position comfortable. You can also look into pregnancy pillows, which are designed with a specific shape to help provide the type of comfort and pressure relief that you need. The most important position to avoid is sleeping on your back. This position can put a lot of stress on your back, can exacerbate heartburn, and can impinge on arteries that are important for your circulation. Sleeping on your stomach doesn’t pose any risk to your baby, but it can be extremely uncomfortable as your belly grows. Depending on how you position your pillows, this could place strain on other parts of your body as well. We’ve all heard the stories and seen sleep-deprived parents among us. It’s a common refrain that sleep is what parents, especially parents of newborns, miss the most. While the burden of reduced sleep can affect both parents, it tends to fall more heavily on new mothers. The need to wake up in the night to attend to a newborn can lead to sleep troubles for two reasons. One is diminished sleep quantity as some new moms simply do not get as much total sleep as before. The second, and often less recognized, is fragmented sleep , which can cause a higher level of daytime sleepiness. Even if moms can maintain a similar quantity of sleep by napping or staying in bed longer, the quality of that sleep is typically lower. Both sleep quantity and quality may also be affected by stress or anxiety that can come about after the birth of a new baby. Physical fatigue: your body relies on sleep to keep functioning at a high level. Without enough sleep for recovery, you may feel lethargic or experience muscle soreness. Daytime sleepiness: fragmented sleep increases drowsiness, but most new moms still have many responsibilities to manage. Going through the day without being rested can increase stress and mental fatigue and can add risk to activities like driving. 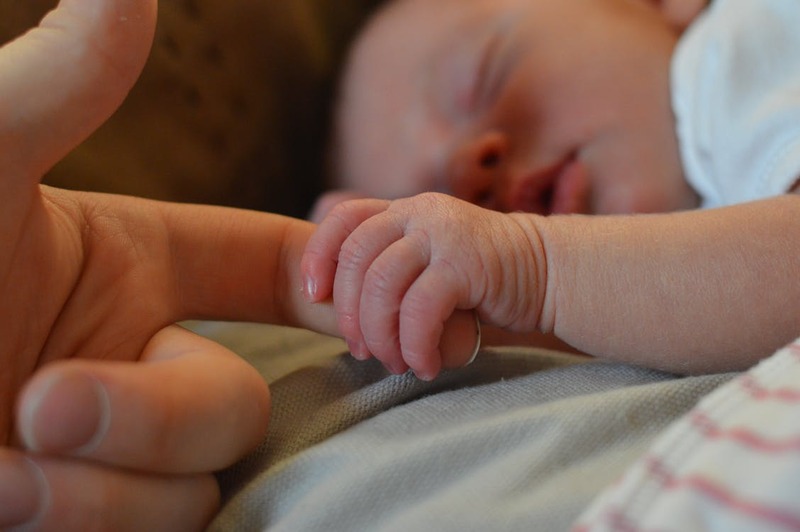 Risks of postpartum depression (PPD): it is normal for new mothers to experience what is sometimes called the “baby blues,” in which they may feel sad or anxious after giving birth. If this persists and worsens, it can become PPD, which is experienced by 10-15% of new moms. Sleep deprivation, especially when prolonged, can contribute to PPD and its symptoms. While some new mothers may be tempted to use sleep aids — such as prescription or over-the-counter sleep medications — it is important to talk to your doctor before taking any of these medications. Many of these drugs have side effects or can be habit-forming, and some may not be safe for mothers who are breastfeeding. While welcoming your new baby into your home can bring a bevy of wonderful moments, it can also pose real issues for your sleep. Though many of the challenges to getting a full night’s sleep can persist for a while, there are still steps that you can take to try to reduce sleep deprivation and its impacts. Sleeping when your baby sleeps. If your newborn takes a nap in the afternoon, try to nap right alongside them. While it’s tempting to try to handle other chores or projects while your baby is napping, this is a great time to help get caught up on your total sleep hours. If possible, try to make it through a full sleep cycle (90 minutes). Keep it dark: try to avoid blinking lights (like chargers) that are easily visible. Consider using blackout curtains if your current blinds let in a lot of exterior light. Limit screens in the bedroom: studies have demonstrated that the light that we’re exposed to during “screen time” interrupts our natural processes to help fall asleep. Try to also avoid screen time if you wake up in the night to feed or otherwise take care of the baby. 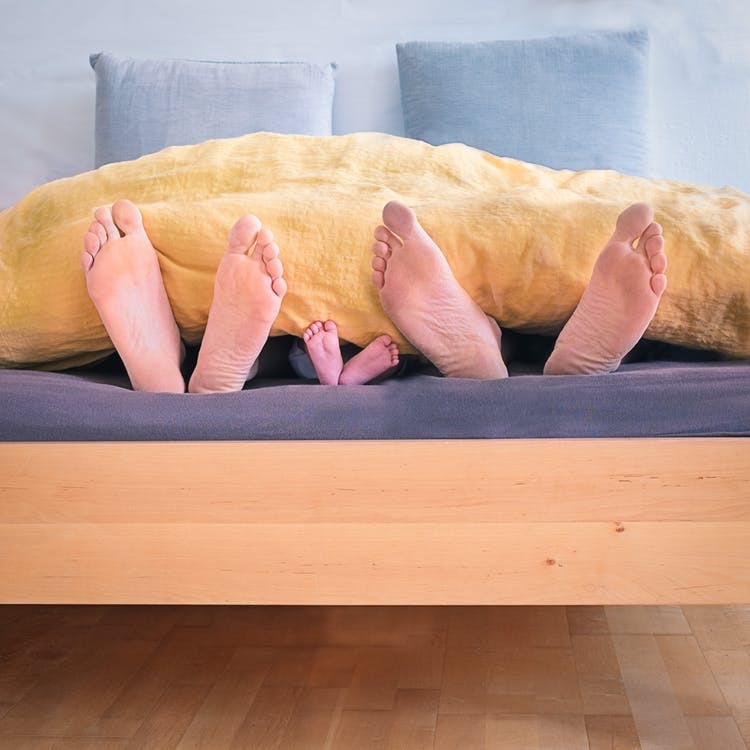 Have a cozy bed: if your old mattress isn’t providing you the comfort and support that you need, give some serious thought to adding a mattress topper or replacing the mattress altogether. Exercise: though its exact impact on sleep is not fully understood, exercise is an important part of your overall health and early indications are that it may ease problems with insomnia. Find a relaxation program: whether it’s deep breathing, meditation, mindfulness, or yoga, finding a relaxation strategy that works for you can help you get to bed and can decrease stress levels. Avoid caffeine: coffee, many teas, sodas, and other caffeinated beverages can all interfere with your ability to get to sleep, especially if consumed in the afternoon or later. Limit alcohol: even though alcohol may bring temporary stress relief and can make you sleepy, the sleep you get when buzzed is typically of lower quality. Consult your physician: if you are continually struggling with sleep or if you notice that you have persistent issues with depression, anxiety, fatigue, or other symptoms of PPD, talk to your doctor. They can help discuss what to expect and any steps that may be available to help. There are numerous day-to-day needs in caring for an infant, and these needs are often layered on top of other obligations like earning an income, paying the bills, and keeping up with household chores. When two people work as a team, these tasks can be addressed more efficiently, allowing more time for much-needed sleep. And as both partners work to adjust their life routine to include their newborn, it provides an opportunity to try to implement healthy sleep habits. After having watched a partner go through 9 months of pregnancy, most new dads are eager to try to help out with a newborn at home. By helping out with daily tasks, fathers can give their partners more time to catch up on sleep. One of the most important ways that new mothers can chip away at their sleep debt is by sharing the responsibility for nighttime or early morning feedings with their partner. It is important for dads to be ready and willing to learn the tricks of the bottle-feeding trade quickly so that they can help out early in the process. Once you have this down, you and your partner can find a rhythm for timing feedings with the goal of allowing each person to get a few uninterrupted hours of sleep each night. 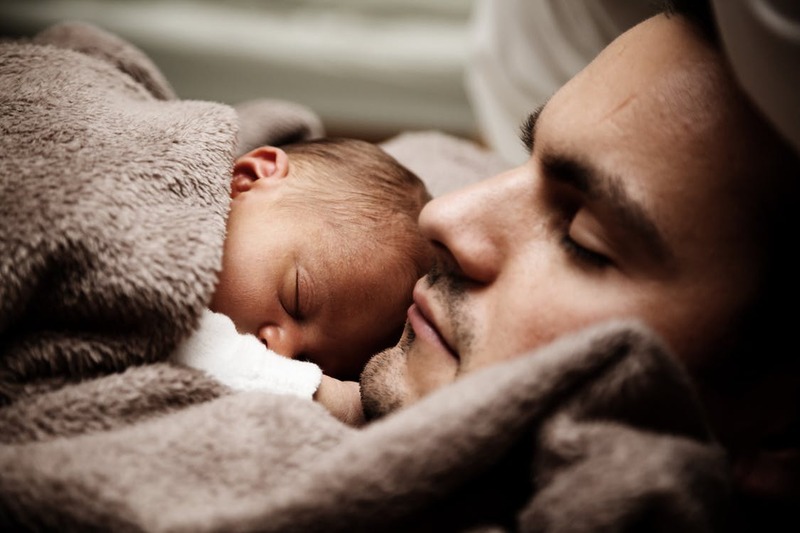 Request paternity leave: find out about what kind of time off is available and utilize that time to build a bond with your new child and to provide critical support to your partner. Help before and after actual nursing: though there are some tasks, such as breastfeeding, that you can’t do yourself, you can help by changing, burping, and soothing the baby when necessary before or after mom is nursing. Test out baby-soothing techniques: work to find ways that you can help soothe your baby during the daytime. By developing these skills during the day, you can be more practiced and effective at night to keep from having to wake a sleeping mother who is trying to get rest. Be proactive about household chores: try not to wait for things to reach a critical state before addressing things around the house. Doing a little bit of cleanup or organizing each day can prevent messes from accumulating. Be positive and supportive: the baby blues after giving birth can be a challenging emotional time for many new mothers. Being patient and thoughtful can help improve communication and reduce stress. Sleep when you have the opportunity: if it’s your turn to sleep, don’t waste it! Practice good sleep hygiene so that you can make the most of your opportunities to rest. Because moms, especially breastfeeding moms, often handle the majority of feedings, It’s common to think predominantly about them when thinking about sleep deprivation after childbirth. But new fathers can also face serious sleep-related challenges. Fathers may also be awoken in the night by a crying infant in need of attention, and they too can be affected by stress and anxiety that can disturb sleep. Some research even indicates that men may get quantitatively less sleep than new moms, although they usually have fewer sleep interruptions. In addition, sleep and restfulness is complex, and there is some evidence to suggest that women who breastfeed may have deeper sleepeven if they get less of it. Don’t overdo caffeine: it may be tempting to turn to coffee or energy drinks as a crutch to combat daytime sleepiness, but this can backfire if your caffeine consumption keeps you up at night. Find other ways to stay alert: instead of caffeine, try using temperature modulation, upbeat music, going for walks, or other strategies to help you stay awake during the day. Limit alcohol intake: as we mentioned for new moms, alcohol can reduce sleep quality, so be careful about your consumption. Enhance your sleep zone: make sure you’re comfortable with a good mattress, supportive pillow, and welcoming bedding. You may also want to consider getting a sleep mask and ear plugs for the nights when you need to try to sleep without interruptions. Perkongsian yang ohsem.. yang penting kena ada kerjasama suami..